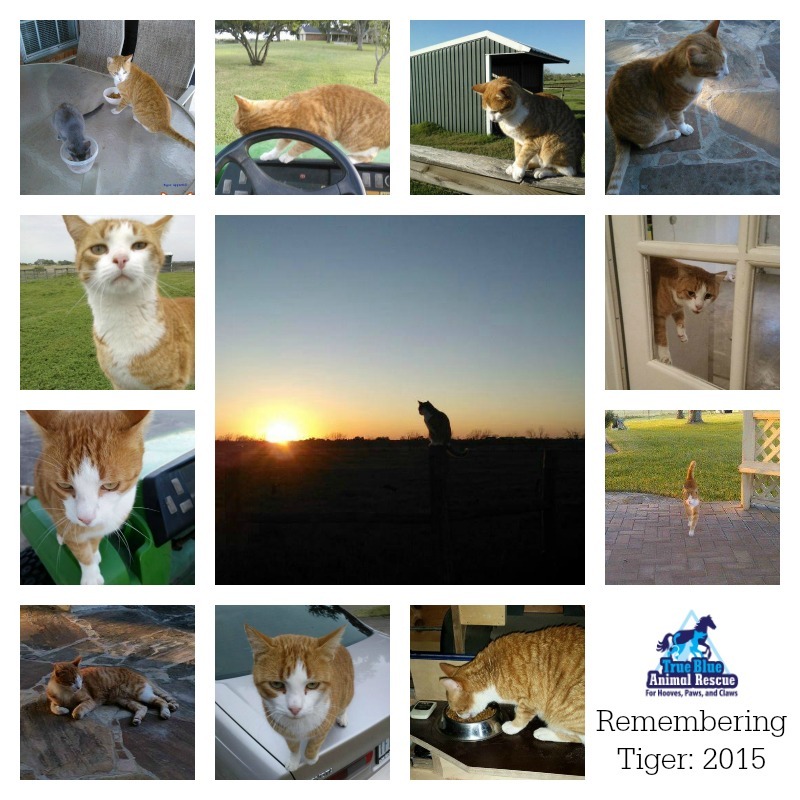 Tiger is a cat who has left a legacy. He disappeared around April 16, and since then has made waves in the world, sparking a debate about the importance of feral and outdoor cats. Not many know Tiger’s whole story though, and his good friend Amy has shared with us his biography. 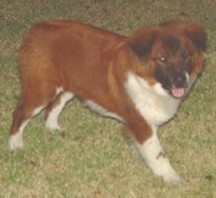 Amy was a pet sitter and caretaker for Tiger and his farm friends for over three years. Tiger was abandoned at a farm home when he was just a kitten. The couple that lived there never turned down a “dumped” animal as they love all animals. 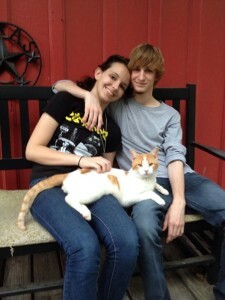 They named him Tiger because he was a beautiful orange & white tabby. 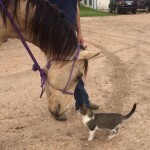 Tiger stayed by the house until he was old enough to live at the barn and rid it of mice that would get into horse & cattle feed and tear up other various important wires. Before taking him to the barn, his owners made sure he was old enough and got him neutered, fully vetted, and up-to-date on vaccinations. 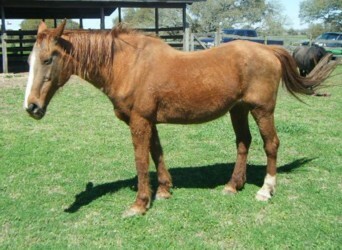 Tiger had a routine over the course of his 6 years at the farm. 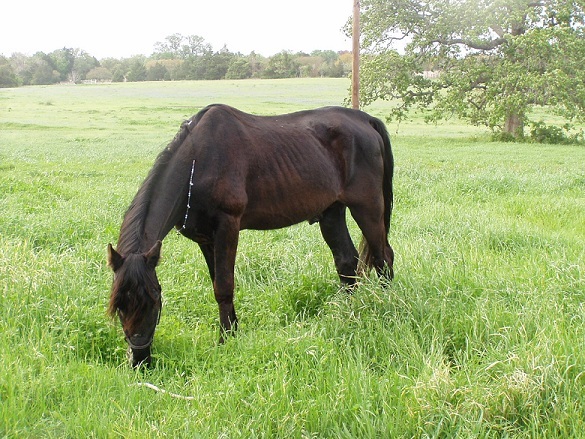 During the day and late night after dinner he would either be in the barn protecting the horses, who became his best friends, or he would spend time in the pastures with them – sitting right next to them while they grazed. In the evening before sunset he knew it was dinner time so he would come up to the house for his cat chow and wet food mix. He looked forward to this every evening and would talk to you about it. He would even show you where you were supposed to set it down for him to enjoy. Over the course of 3 years of taking care of him (half of his life), I witnessed very interesting things with him. 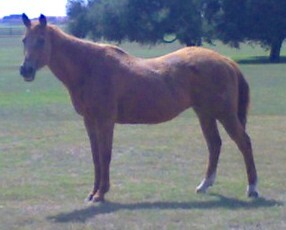 For example, he loved to ride on the Gator tractor with me to the barn and back to the house, he never left my side…no matter where I was on the property he was right there next to me as my protector, so in a sense I became part of the farm he watched over. On the property there were cattle, horses, dogs, goats, a kitten, jack rabbits, baby birds that had fallen out of nests, frogs hopping around, spiders building webs and he never once caused harm to anyone or anything. He had a pure heart of gold and is one of the best coolest cats I have done pet sitting for. He was in a class all his own. Unfortunately the couple had to move away due to health reasons. They gave Tiger to the next door neighbor to keep him in familiar settings, plus the neighbors were given the horses that Tiger used to hang out with. It took some adjusting, but Tiger would spend the day at the old barn and would make the trek across the fields to get to the neighbors for his dinner. He would eat and then make the trek back to the old barn. This went on for a couple of months and it seemed to keep everyone, including Tiger, happy. Then Tiger went missing. The first couple of nights of untouched food was dismissed as bad weather since it was almost nonstop rain and storms in the area. Then came the horrible night I saw the infamous posting of a vet holding up a cat at the end of an arrow…..the cat was identical to Tiger. I continued putting food out until the end of my time for pet sitting at his house, but he never showed up to eat. It has been almost 4 weeks, and although we all still have hope, he has never returned for his dinner and we all miss him dearly. Amy and Tiger’s owners have set up a donation fund in Tiger’s memory with us at True Blue Animal Rescue. We are working with different groups, including Alley Cat Allies, and will be creating an educational and assistance program to help springboard a Trap-Neuter-Return program that will strive to inform Washington and Austin County residence about the options for stray, wandering, and feral area cats. This program is beginning this year in Tiger’s name, and will continue for years and generations so that Tiger’s legacy will live on to save the lives of other cats in the area and worldwide. If you would like to donate in Tiger’s name, you can do so from our Paypal Donation link, or you can purchase a “I Am Tiger” shirt from Amy’s Booster fundraising page! Thank you for choosing TBAR to Remember Tiger! People can also “like” Tiger’s memorial Facebook page. This cat has been around the house for about a 1.5 months and I have chased it off my patio because it was eating my cat’s food and has been squirting Dave’s shop, but after [Tiger’s Story] it made me change my attitude with this cat. I started going downstairs when I would hear it meow because he was hungry and I would feed it. Of course he didn’t want me to touch him or come near him, and after 7 times of feeding him he brushed up against my foot!! It took sometime but this is where we are at -YES we have bonded! 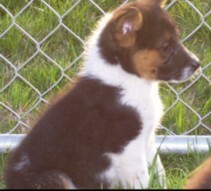 Now I will get him fixed and try to find him a home because our cats would not like him because they are selfish!! So I took a bad story and changed my thoughts and made sometime positive for another CAT!! And here is the picture of this very cat in his new home! Thank you Melissa, for making Tiger’s legacy mean something beautiful! 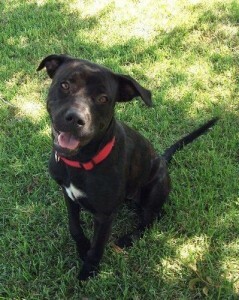 Ladybug wandered up to a home in Industry, TX where a kind family reached out for help. Ladybug appeared to be ill and the family couldn’t afford the veterinary expenses, but couldn’t see her suffer. 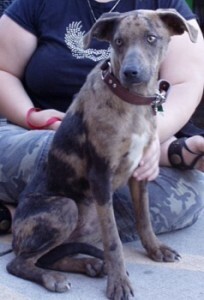 TBAR sent her to the vet for treatment of what appeared to be a minor illness that needed antibiotics. 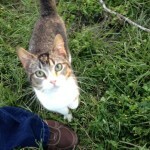 After two week and antibiotics having no affect, Ladybug was returned to the vet very sick and diagnosed with FIV. Most FIV cats can go on to live normal, healthy lives – but, sadly, Ladybug’s immune system was just too weak and her rescuer helped her cross the rainbow bridge peacefully. This brave little girl was loved during her time with the family and is sorely missed. 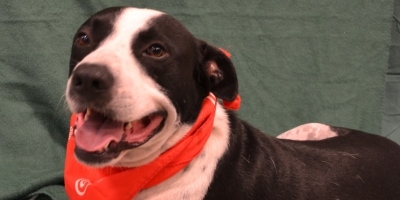 Hubba Hubba was a very handsome black and white Staffordshire Bull Terrier mix who just wanted to be near people and be loved unconditionally. 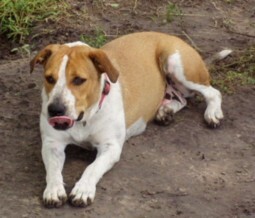 He was dearly loved by his foster mom and is very missed by his foster siblings. 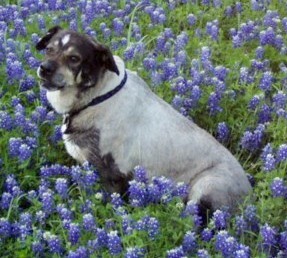 Hubba has crossed the Rainbow Bridge but will never be forgotten. 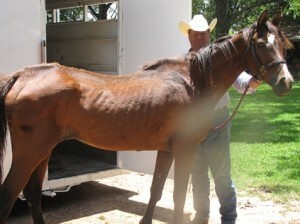 Cinnamon was chained to a gate on a hot day until a good Samaritan freed her and took her in. She was a sweet girl with a spicy personality that made those around her absolutely adore her. Cinnamon was cherished and loved by her foster mom and never knew the chained life again. Now she is running free far from this world, but still very close to our hearts. 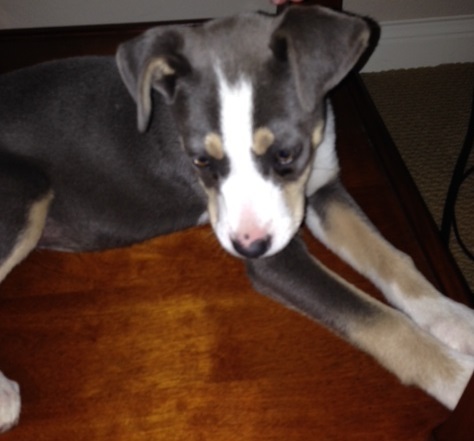 Sadie was rescued with her sister, Marley, as a very malnourished and skinny puppy. 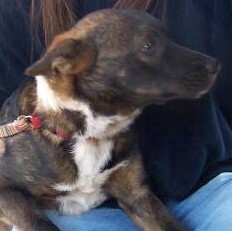 Soon after being rescued and finding an adoptive home, our sweet Sadie passed on from this world. Her last few days on this world were filled with love and plenty of yummy food. 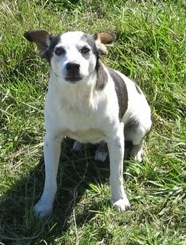 She is dearly missed and has taken a part of her mom’s heart with her over the rainbow bridge. 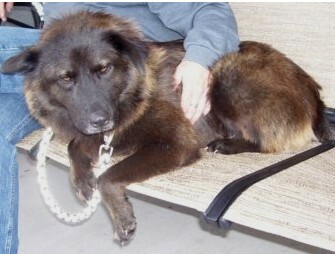 Shadow showed up as a stray dog with an injured leg that resulted in a slight limp. 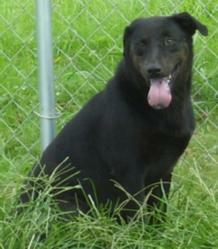 She was a beautiful black Labrador mix who enjoyed running and playing. She never hid her inner puppy and will forever be a part of our hearts. Anya, Lila, Lana and Nikolai were dumped on a back road in Anderson, TX and were lucky enough to be found by a TBAR foster home. They lived for one wonderful month in a loving foster home after testing positive for FeLv but not showing symptoms yet. A confirmatory lab test had been sent to New Jersey before they began to show symptoms. 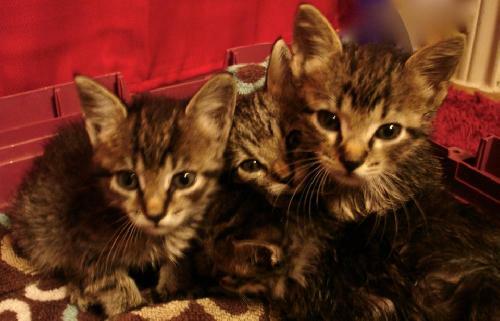 Once the symptoms set in, their quality of life went downhill quickly so their foster mom agreed with the vet that it was time to help them cross over the Rainbow Bridge peacefully. Chester was found by a TBar member, running along a busy street. 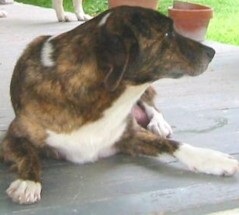 He was emaciated and seemed to have been hit by a car. 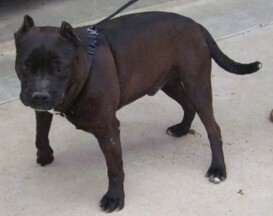 Chester enjoyed love, running free in a safe backyard and lots of food while awaiting amputation of his nerve-damaged leg. Unfortunately, he died during amputation surgery. RIP Chester. 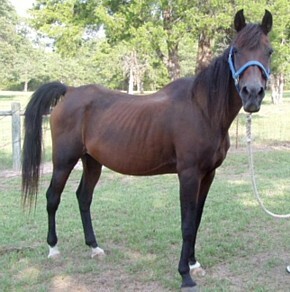 The last horse rescued from a 57 horse seizure, Omega touched every person who met him. 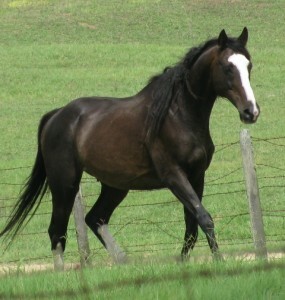 He was a majestic, noble creature and has left indelible hoof prints on everyone who loved him. 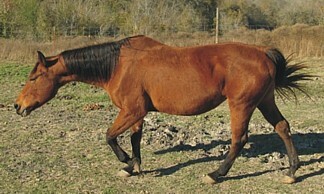 Omega was lost to colic-twist in June. 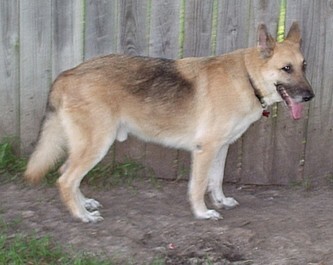 Tripp came to TBAR dragging a chain with a collar way too tight and heartworm positive. 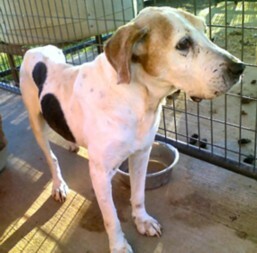 He healed beautifully and was loved deeply by his foster home. After only 1 short year, he left this Earth suddenly & unexpectedly. His good nature and love of life touched many people. RIP Tripp! 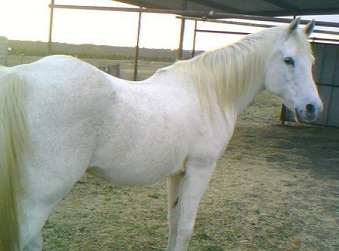 Warrior came into TBAR so skinny, but grew into a beautiful, white Arabian. He was loved dearly by many and left this world too soon from a sudden illness. 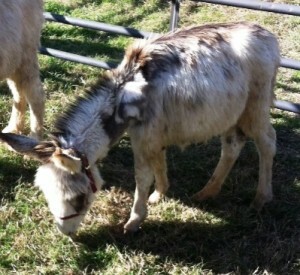 This little donkey was one of 19 that were removed from their owner because she could no longer care for them. 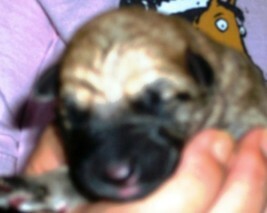 His little body was all bones and his mother was dried and unable to provide him proper nutrition either. We fed him milk and feed in an attempt to get him to gain weight and recover. In a final attempt to save his life the vet tubed milk into him but he continued to decline and eventually passed away. This picture was taken while he still had the strength to stand and we’ll always remember him enjoying some grass and some peace before he crossed the rainbow bridge. 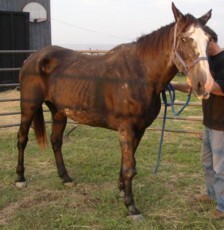 One of the Hopkins County horses, Bree was adopted and loved by TBar’s Abuse/Neglect Coordinator. 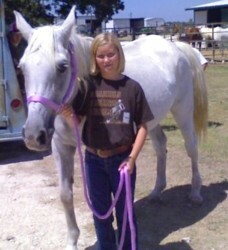 Her first horse since childhood, it was love at first sight. Unfortunately, Bree left our world way too soon from severe colic. God has a beautiful, spirited girl by his side now. 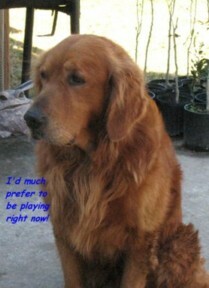 Cancer claimed our sweet Dr Livingston at only 6 years old. But he had a good life and new love. Semi came into TBar severely emaciated, but was restored to full health and had a glorious 2 years of love with TBar’s Ralph and Loretta Pinnell before leaving us. 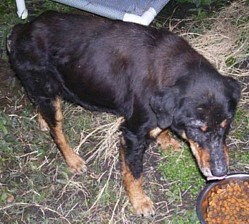 At the time, Hope was one of the worst neglect cases TBar had ever dealt with. 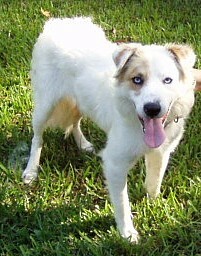 Hope fought to live and became a happy, healthy girl. 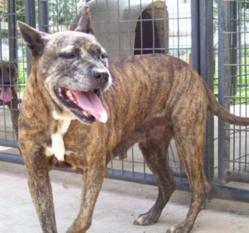 She was loved by her foster home and died peacefully in her late 20s. 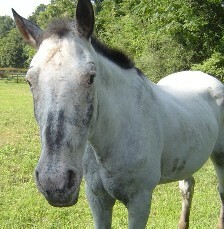 35 years young, JJ had 5 wonderful years in his foster/retirement home before he left this Earth. 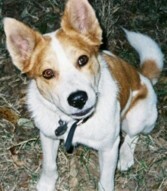 He leaves behind his buddy & companion, Moriah, and many who loved him. Thank you to Joy Hamaker for sponsoring JJ all these years! 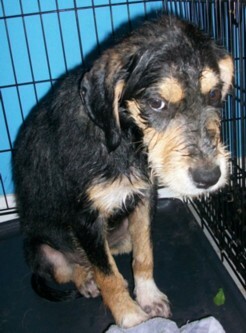 Poor Fresca was so scared in this world – terrified to the point of being aggressive. Over and over again, we reached out with love, but Fresca was too scared. 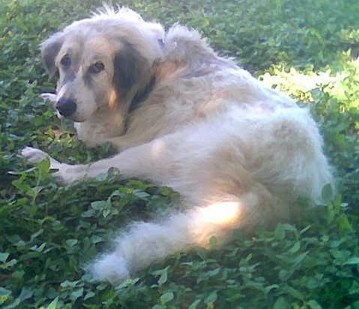 Now she is happy and unafraid in TBar Heaven. We are sad that we could not help Fresca. A sweet mare from the Hopkins County seizure, Lilly new lots of TLC in her final years. 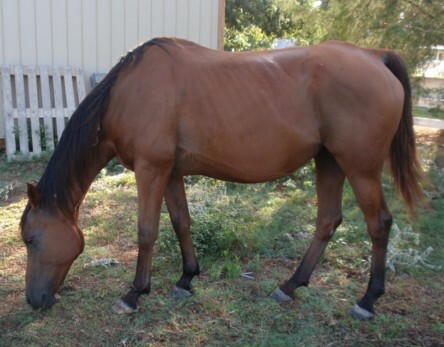 Medicine nor prayers could cure the impaction colic and the difficult decision was made to send Lilly over the rainbow bridge. Loved and not forgotten. 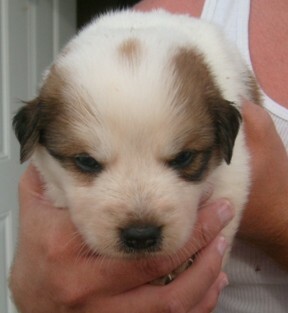 Saved from starving, loved and cared for by her foster Mom. She will be missed. After outliving his prognosis by 3 years, Midnight’s body finally succumbed to terminal melanoma. He passed peacefully and deeply loved. TBAR’s unicorn horse, gently left this world at 36 years of age. He was loved by many, including his foster mom of 6 years. His graceful, elegant presence will be greatly missed. Thank you to Joy Hamaker for sponsoring Moriah all these years! 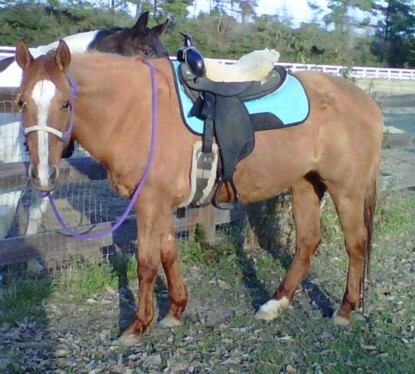 A senior mare from the Hopkins County seizure, Sugar was adored by her foster family. With them, she was fat and happy. Cancer took Sugar from us physically, but not from our hearts. We didn’t get the chance to save her, just end her suffering. She’s running free, healthy and pain free now. 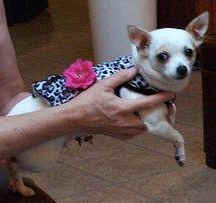 Little Chiquita wasn’t with us for very long.She was very much loved and she crossed over with tears falling on her. She was only 5 yrs old but had severe seizures that would not respond to medication. Rest easy our sweet, senior girl! Loved by her forever home! 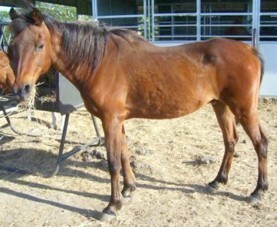 29 yr old Quarterhorse, a winning barrel horse in her younger years, victim of neglect. Image fought hard to live and made it! 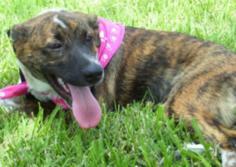 She knew lots of love and TLC in her foster home. Image has been an ambassador and representative for all neglected, starved horses. Katie just showed up at TBar one day, all skin and bones. An angel must have guided her steps to the place where she could find refuge and food. You can tell from her body that this poor girl has seen better times, but that hasn’t diminished her loving attitude and fun-loving spirit. Katie had a wonderful retirement and lots of love in her golden years. In the end, she was held in loving arms and peacefully crossed over. 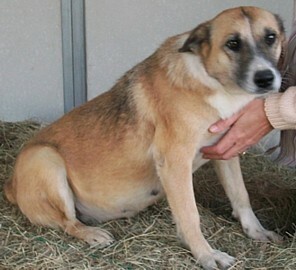 Koda was loved dearly by her foster Mom, but could not overcome the severe starvation. Gone too soon for such a young soul! 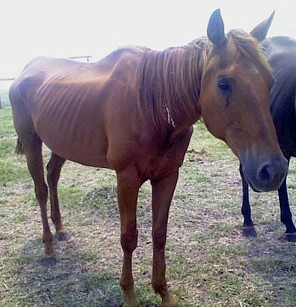 25 yr old Arabian, a winning show horse in her younger years, victim of neglect. 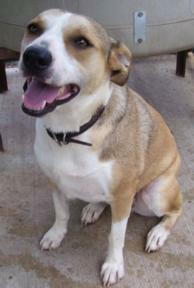 Knew lots of love and TLC in her foster home. Crossed over peacefully, but too soon for those who loved her. Came into TBar as an abuse case, shot with an arrow. Sweet, loveable dog. Crossed over from congestive heart failure. Now he’s digging holes in heaven. Thank you to Jean Hughes and family for taking in this senior, abandoned, injured, starved, heartworm-positive German Shepherd and giving him the best years of his life! Lost her battle with severe EPM. Dolly came to T-Bar as a 10 yr old emaciated dog. She had cancer and would not recover. We made the difficult decision to cross her over after giving her lots of TLC. Found old, sick and very skinny. 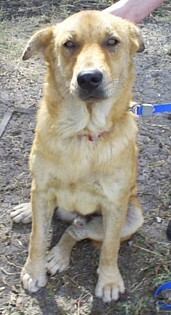 But knew lots of TLC, good food and love in the months before he crossed-over. 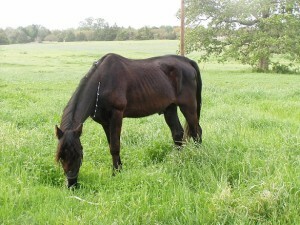 Severe arthritis in her knee coupled with a twisted gut from colic – it was time. You were such an Ambassador! 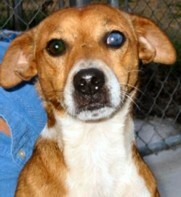 Found sitting on the Galveston seawall in the midst of a cold sandstorm, Benji was rescued and discovered to be completely blind. 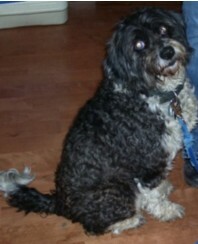 He was the sweetest elderly dog; and knew lots of love and TLC in his foster home. He was called to Heaven too soon. We gave him everything we had: food, love, veterinary care, and prayers; but in the end, we couldn’t save Tuscany from severe starvation. Thursday, July 24th – TBAR (Melanie and Dale) went out to meet the vet and check out this horse after a lady called TBAR and told us he was losing weight and she couldn’t afford to feed him anymore. 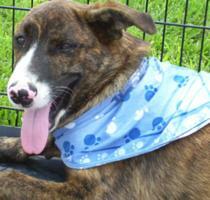 TBAR ended up making an emergency decision and taking Tuscany into our rescue on the spot. He is beyond skinny. He is a walking skeleton. He is a 0.5 on the Henneke Body Scoring. We named him Tuscany. We named him that because we know he will live up to the name when he fills out and becomes the beautiful horse he once was. He’s in his early 20’s which means he is not extremely old for a horse. 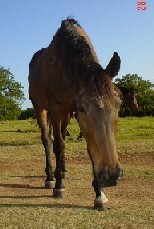 Today horses live well into their 30’s. There is no reason for this guy to be this thin except that he didn’t have enough food. When Dale and I went out to see him after a phone call from the owner telling us that she can’t afford to feed him and begging us to take him we were stunned by what we saw. 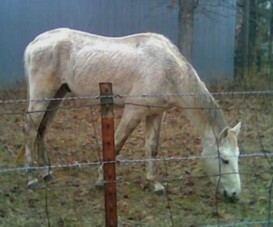 There was some poor quality grain but no hay for this guy to eat but his eyes were bright and he looked at us with hope. Enough said, so we went back and picked up the trailer and took him home. He’s eating senior feed four times a day with plenty of hay so we expect him to come around and start gaining weight quickly. August 13th – Sadly, Tuscany lost his battle to recover from severe starvation; and passed away this morning, unable to rise. In the end, he was ready to go and we helped him cross over. Our hearts are broken, not being able to save this magnificent Soul. He is not suffering any more. THANK YOU to all Tuscany’s supporters!! For the last 3 weeks, Tuscany knew love and care from humans. He was honored as the brave, courageous Spirit that he was. And had plenty of food (in small, frequent quantities), shelter, warmth and tender loving care. Please light a candle for Tuscany. Say hello to Chief, Toot, Chai and the other TBar horses in heaven, Tuscany. Tell them we miss them and look forward to seeing them again some day. We don’t know why you were taken from us, but we’re comforted knowing you were loved so much before you left. We’re glad you knew love and a full belly before you left us, Possum. 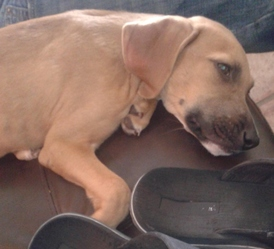 Even though he’d had 2 booster shots, Cooper was lost to an unexpected case of Parvo. Gone too young. Passed peacefully in his sleep of old age. At 17 yrs, Buddy had a good life. 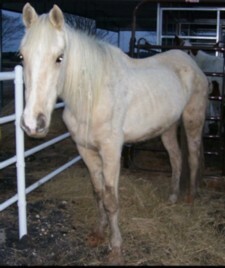 Chief was seized with 2 other horses for severe neglect. He was all bones and could not stand, even with lots of people helping. 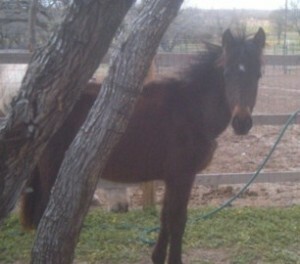 TBAR spent the night in the pasture with Chief, hoping he would be able rise in the morning. But his weakened body could not recover. Now Chief is at Peace with all the food he can eat and lots of love. He will never suffer again. Sometimes, no matter how hard we try to save them, it’s an animal’s time to go. Such was the case with Cowboy. Rescued from neglect, we’re thankful he new love, care and happiness in the end. Our hearts are heavy that he left us so soon. 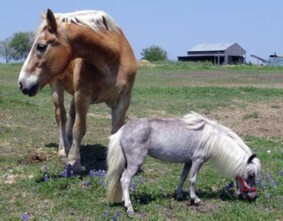 This pony suffered from moon blindness, but found love and healing at her foster home. 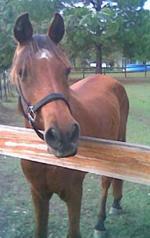 Daisy passed over the Rainbow Bridge from a sudden, severe case of colic. Now she can see again. Lil Bit was so tiny, even for a mini, and Big Ben was so big. And yet they were best friends. They were the favorites of visitors to TBAR and will be deeply missed. They passed within months of each other. Lil Bit died suddenly as can happen with tiny minis. 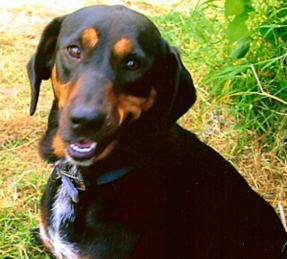 Big Ben was older and died peacefully while fighting a serious illness. 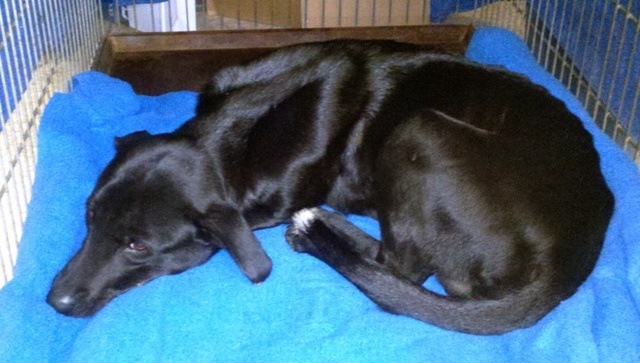 Sadie knew it was her time, so she laid down by her pups, Jasmine and Marcus and went to sleep. We’re comforted that she knew lots of love in the end. This graceful, elderly lady was rescued from the auction house and lived out her last years with lots of love and care. She was featured in ABC’s Extreme Makeover: Home Edition. 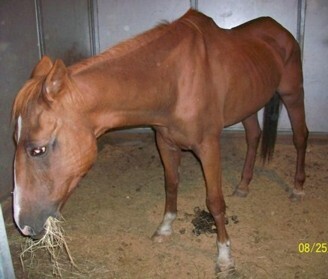 Toot was seized by law enforcement and was severely starved. 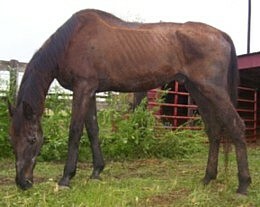 TBAR and the vets did everything they could to save Toot, but his poor body couldn’t come back. 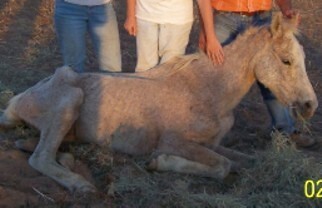 It broke our hearts to see such a young horse suffer so; and his story still pains us. At least now he is at Peace with all the food he can eat and lots of love. Once upon a time (a couple of weeks ago), Melanie, founder of True Blue Animal Rescue (http://www.t-bar.org), was called to the local auction house to rescue a donkey that was slated for the auction, meaning it would most likely go to a slaughterhouse buyer. 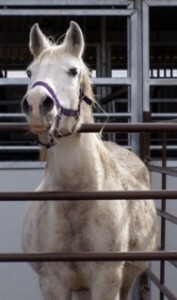 Melanie shows up to pick up the donkey and is told by a woman about another horse that was brought in and tagged for auction – a small Arabian horse that was thin, but gentle, good with kids and had lots of years left in her. 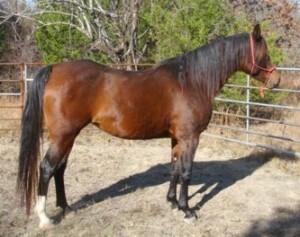 The owners said they’d pull her from the auction for $150. While Melanie is there looking over the little Arabian, she notices another horse in the far corner of the pen with a glassy-eyed look – the one you see in a horse that has been run through the auction already. 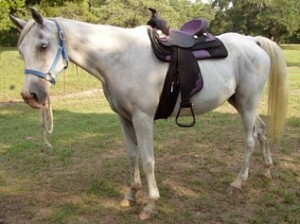 Inquiring about the horse, Melanie is told that nobody bought it because none of the killer buyers were there. He looked pretty sad – skinny, shabby and a swollen knee. It wasn’t hard to guess where he would end up. Melanie continues to look over the Arabian; and to her surprise the other horse walks right up to her and puts his head on her chest. She thought “Oh no, not this one too!” Melanie goes back to checking out the Arabian. Well, the other horse walks over and puts his head in her chest again, so she hugs him. Now there’s no way she can let this guy go through the auction again only to end up at the slaughterhouse. As she said, “He didn’t know he already had her ‘at hello’, as was said in the movie Jerry McGuire”. 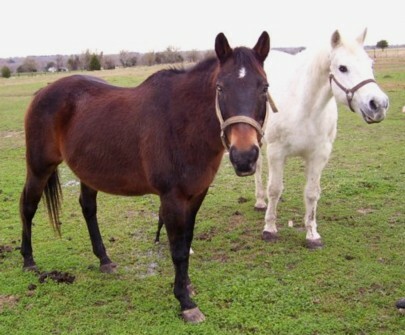 As Melanie is walking out of the pen, this same horse walks in front of her and lies down groaning as he went. Melanie had to stop; and she told him “OK, OK. You can come home with me too.” So True Blue Animal Rescue buys the little Arabian and the boy horse, saving them both from slaughter too. Move forward a couple of weeks now. Chai, as he’s now called, Hebrew for ‘life’, symbolizing his second chance at life, has been enjoying good food, a warm stall, lots of love from Melanie at True Blue Animal Rescue, and good veterinary care. Turns out he’s about 30 years old and a sweetheart. 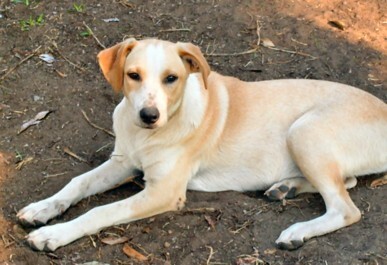 One morning, Melanie goes out to feed and finds that Chai passed over the Rainbow Bridge during the night. He looks peaceful, at rest, calm, and contented. Do you see the sacred task that Melanie was asked to perform? Melanie was CALLED to save this horse – he literally begged for his life; and she answered with a loving YES and took him home. Chai was able to enjoy love, comfort, peace and compassion and leave this life peacefully for greener pastures because of her grace and compassion. 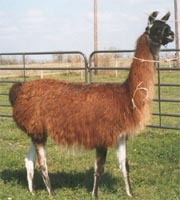 Fallon is a 15 year old Llama that was donated to T-Bar because her owner wanted her to have a good home. She will be a permanent resident at a T-Bar facility so she won’t have to become stressed over another move. She is a sweet animal, but not especially friendly. She would rather just be fed and then left alone. We enjoy watching her and talking to her while she intently listens. 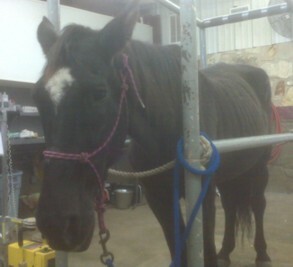 Nicole choked and had to be tubed by a vet to get the blockage out. This intervention caused damage to Nicole’s esophagus that she could not recover from. Even mash would make her choke. We laid her to rest in order to allow her peace. 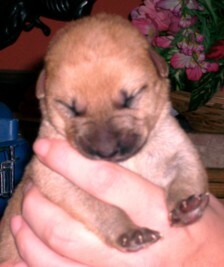 Anniken and his brother Yoda were found in the middle of the street and were rescued before being hit by a car. Both were in bad shape – very sick little boys. 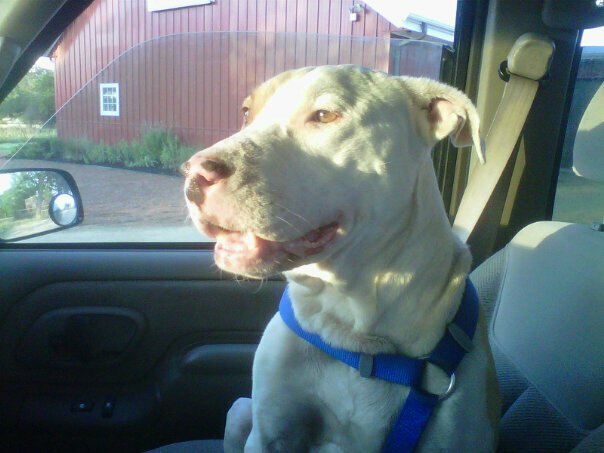 They received much love, attention, veterinary care and prayers, and put up a fight. But in the end, Yoda couldn’t hang on and now Anniken must go on for both of them.